When I was a child, I was fascinated by my grandmother’s Jade Plant (Crassula ovata). She had placed it next to a window at the top of the second floor steps. It was a large plant. It draped majestically over the pot onto the mahogany plant stand. I loved the shape of the leaves, so round and full. The lovely green glistened in the sunlight. When I went off to college, my grandmother gave me my own Jade Plant. I was a teenager. The poor planted lasted only one semester. A decade later when my grandmother passed away, my mother offered me her beautiful Jade Plant. It’s been a treasured part of my home for a decade now. I learned how to start a new Jade Plant from cuttings so I could share the plant with my cousins. I gave them the plants and with full care instructions. I detailed the specific water, sun, and temperature requirements so Gran’s plant could live on for another generation. I’ve put this guide together from my notes. It will help you make your Jade Plant last a lifetime too. Cut a 3-4 inch branch (about 7.5 – 10 cm) with several groups of leaves and approximately 1 inch of stem. Place it in a folded paper towel in a warm spot where it will be undisturbed. It needs to dry. It will be ready to root when you see a callus form at the bottom. At this point, it’s ready to dip into rooting powder and place into a pot of fresh soil. The soil should be a 50/50 mix of perlite and soil. Water the new plant sparingly keeping the potting mix damp but not wet until the plant has taken root. This will take a few weeks, and yes, it’s okay to peek, just be careful pulling it out and putting it back in to the soil. I recommend starting with a small pot and repotting as the plant grows. Jades can stand getting a little root bound in their pots. 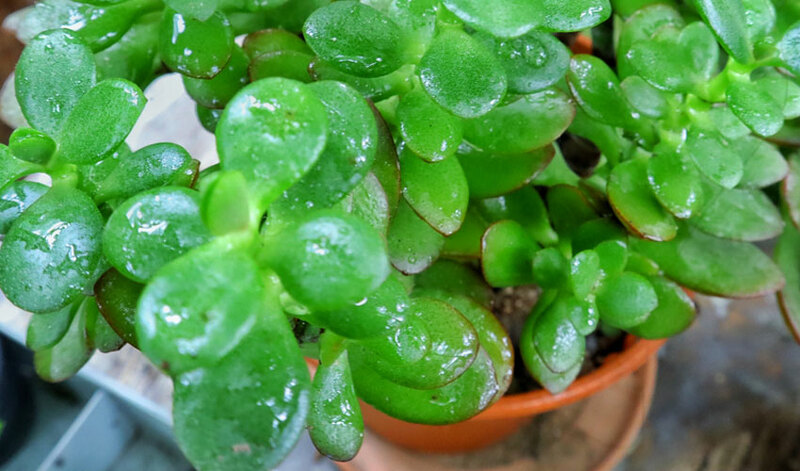 Jades should be watered regularly but allowed to dry out in between waterings. They should not be over watered and then allowed to dry out for a long time. I’ve made that mistake. These are easy plants to maintain and they will last a lifetime, but consistency is still key. It’s important not to get the leaves wet when watering. They will turn brown if you do. One trick I’ve learned is to water the plant from below by filling the saucer. After a short time, I’ll check back and remove any water that remains. A south-facing window is an ideal location for a Jade Plant. They need at least 4 hours of sunlight a day. The ideals range from 65-75 F (17-24 C) and they like cooler evening temperatures but 55 F (15 C) is about as cold as Jades Plants like to get. Move them away from drafty windows in the winters. Leaf shedding or black/brown spots: These show that the plant needs to more water. Over-watering is a danger, but so is under-watering. White spots: These can occur when you water with a salty solution. It’s always a good idea to rinse out your watering pot and run the water in the tap before filling it if you can’t use filtered water. White spots on the surface of the leaf pads can be gently wiped with a moist cloth and the leaves will return to their beautiful green shade. Powdery mildew: This problem will occur when a combination of things happen such as low light, cooler temperatures, too much humidity or poor air circulation. Placing a fan in the room with the plant can help with circulation and reducing watering can help improve conditions. To deal with the mildew itself, pinch off the most affected leaves. You can make a solution of ⅓ baking soda ⅓ water and ⅓ white vinegar and spray on the leaves – but don’t get them soaking wet. You can also gently wipe the leaves with the solution. If the leaves don’t dry within a few hours, dry them with a soft cloth. Mealybugs and Scale: These are white spots that, if you look closely, are actually moving. To address this condition, separate the plant from all other plants. The condition spreads quickly. It often comes in with a new plant. Make a solution of 3 parts water and 7 parts rubbing alcohol and dab the leaves with the solution. Let it be for a week or two and if the condition remains, repeat the treatment. Consider treating any plants that were near the Jade Plant as they too may be developing the condition. Spider mites: If you find white webbing on leaves and stem, the plant has spider mites. There are two options for treating the plant. The easiest is to mix rubbing alcohol and water. The mixture should be just 1% rubbing alcohol. You can gently wash the leaves and stems with a cloth dipped in the solution or use a cotton pad or ball. The other option is to use a horticulture soap designed for succulents and follow the directions. Feed the plants with liquid fertilizer 3 or 4 times a year. I feed my plants at the start of each new season, it’s the easiest way for me to remember. Jade Plants will go into dormancy in the winter when there’s less light. During winter it’s essential you give the plant less water. If you care for these beautiful plants properly, you’ll be able to pass them onto your grandchildren too.